Home Editor Joanna Linberg, a passionate salad fan, peeled rainbow carrots until the cows came home—with beautiful (and delicious!) results. We need to get something out of the way. Those aren’t prunes you see in the photo above—they’re dried plums. Nobody wants prunes at their picnic. Why this recipe? Chickpeas are a favorite of mine. Sometimes I spoon them out of the can, sprinkle a little salt on top, and munch on them, feeling like I’m living my best life. 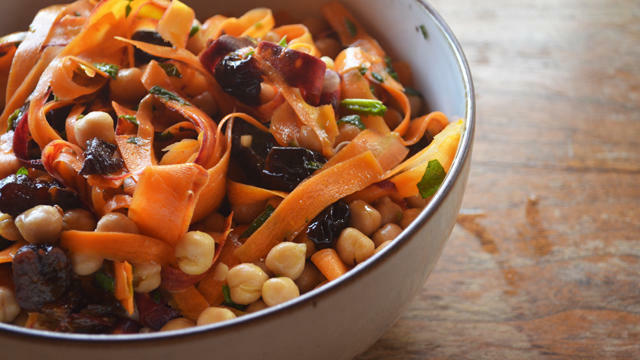 A skim of the rest of the ingredient list told me that this salad would look really pretty (think ribbons of heirloom carrots studded with chickpeas, dried plums, and mint). And at a fancy picnic, it’s all about impressing. What was it like to make it? Easy, but time-consuming. I don’t want to tell you how long it took me to peel my carrots into ribbons. Ok, yes I do: About 25 minutes. Was I maybe spending a lot of that time talking to the other Sunset picnickers who were prepping their meals? Yes, but my hands never stopped moving. I did appreciate that you could make the dressing right in the serving bowl, then toss it all together. How did it turn out? And would I bring it to a picnic? It was delicious—crunchy from the carrots, substantial thanks to the chickpeas, and very balanced in terms of sweetness and acidity. Would I bring it to a picnic? Even though I made my salad right before I served it, I can’t imagine it disintegrating after a day spent in the fridge, so it passes the make-ahead-and bring test. Not only would I would bring this to a picnic, I would make it at home for dinner parties, too. But I have to admit: Next time, I will send the carrots through the food processor to sliver them, and I’ll probably add a little more paprika to get more smokiness. Whisk together the oil, vinegar, honey, salt, and paprika in a large bowl until emulsified; set aside. Peel and discard the tough outer layer from the carrots and trim the tops. Pin the tip of each carrot to a cutting board using a fork, and begin shaving it into long ribbons with a peeler until you reach the core. Flip the carrot and continue shaving until, again, you reach the core. Pile the gorgeous tangle of carrot ribbons into the salad bowl, and toss the cores to your dog, who’s giving you the side eye. He’ll thank you. Add the chickpeas, dried plums, and mint to the bowl with the vinaigrette, and toss well so that everything is coated nicely and thoroughly mixed together. Taste and adjust the seasoning. Transfer the salad to a portable container and refrigerate until the picnic, or up to 8 hours.